Home - Traders Tips - Is Bitcoin a Big Bubble? We don’t often write about the Bitcoin or any other cryptocurrency but today we feel that it is an important thing to do, as the opinions about this cryptocurrency have been quite controversial. Before we go on in the details, let’s simply define the bubble. 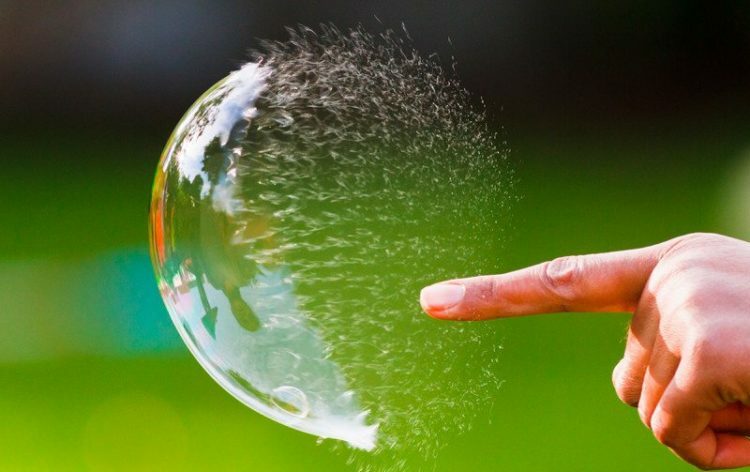 In finance, a bubble is a rapid growth of a certain asset which is then followed by a dramatic drop in its value. Until now, we have been being some dramatic increases in the price of the bitcoin. The main question is, will it go down? And in case it will, how fast? We know that most of the readers will hate us for this statement, but yes, we do feel that the bitcoin (at its current rate) is a huge bubble. We, however, love the bitcoin and we hope for its best, yet it is clear in its current form it is nothing more than one of the riskiest things for investment. According to our forecasts, the bitcoin is here to stay, yet at a completely different rate. Let’s examine why. Any currency or commodity has its value driven by the demand. Nobody really needs US Dollars unless you can actually buy something for them. Historically, most of the countries and companies have been believing in the strong economy of the States, hence they kept their savings, pricing etc in the USD. Gold can be used in production, yet it is also a key ingredient for the jewelry, which is adored by so many people. While diamonds are nearly useless, a large part of our population likes these shiny things, hence there is even some demand for them. However, what are the use cases of the bitcoin? You might be surprised, but a larger share of the bitcoin transactions is actually sent to various online bitcoin casino websites. Many people love to gamble, and some of the players actually have a very high net worth. The bitcoin helps such people to keep their anonymity while they play poker, roulette or any other game of their choice online. Besides that, in many countries, the regulation for online casinos is very severe, but unregulated bitcoin casinos can evade the licensing and, hence, offer a bigger bang for the player’s buck. So far, the popularity of the bitcoin gambling has only been increasing. There are much more marketplaces online than just Amazon or eBay. Some people prefer buying their OG Kush or a few grams of llello online than from a street dealer. The reason behind this is very simple, you get to keep your identity hidden. Besides that, you will be (most probably, we didn’t check) provided with better quality at a nicer price. However, the governments have been fighting such marketplaces for a while now and they are keen to keep black markets out of business. Besides that, with a recent introduction of Monero, a more secure way to pay for illegal things online, the popularity of the Bitcoin for illegal transactions will drop. There are many Bitcoin enthusiasts in this world, and most of them have tried to make the currency popular by being eager to receive or send the payments in BTC for their goods and services. The thing is, there are some fees attached to a bitcoin payment and these fees make micropayments (like payments below $5) simply unattractive for buying or selling something via BTC. Technically, the bitcoin transaction is a certain file that has to be decrypted, and decrypting it costs money. If we speak of a large transaction, the bitcoin can certainly be good. However, paying $5 for your coffee and then paying another $5 in fees certainly does not look that attractive. As you can see above, regular payments are unlikely to be dominated by the bitcoin. Sales of drugs, DDoS attacks, guns and other illegal things online will unlikely to happen via BTC in the near future, simply because there is a better alternative. Playing blackjack online for bitcoins is, however, more likely to stay this way. This gives us an idea that there is a practical use case for the bitcoin, yet it is very limited. However, the current rate of the bitcoin does not seem to illustrate the reality. How many people would be willing to exchange their dollars or euros to play gambling games online? Certainly many, but not too many. Besides that, we all understand that gamblers are not profitable and they will be driving the demand for BTCs, yet it does seem like the current rate of the bitcoin represents like it is the currency of the future, which it certainly is not. Finally, most of the bitcoin investors of 2017 certainly represent High-Yield-Investment-Programs enthusiasts. They expect to enter the BTC market at the rate between $2500 and $4500 per coin and cash out at around $10,000. Will they be lucky? Some of them – certainly. Most of them – probably not. To sum up, the bitcoin is here to stay and it will certainly not go away anywhere. There will always be some demand for it, yet the current demand is mostly driven by the speculators, and this demand does not reflect an actual demand that is used for transactions. Hence, at the current rate, the bitcoin represents a great bubble.